New Shields Enable Low Bandwidth and Low Power Connectivity to Improve Energy, Fleet Management, Agriculture, Healthcare, Smart Cities and Other Industries. Arduino and Semtech Corporation have teamed to develop Arduino-compatible shields to enable gateway and endpoint long range radio frequency (RF) connectivity using Semtech LoRa® devices and Wireless RF Technology. Developers using Arduino Primo, Arduino Tian, and several other boards, can quickly integrate LoRa Technology into existing projects. Akin to unlicensed spectrum Wi-Fi and Bluetooth connectivity, but operating at sub GHz frequencies, LoRa adds long range RF functionality tailored for IoT to Arduino boards, giving developers the ability to transmit data over tens of kilometers with seamless mobility at very low costs. A growing number of community LoRaWAN™ networks can be joined for free. “The combination of smart things with the connectivity of LoRa Technology is enabling new business opportunities by offering unique ways to build communications into industrial and consumer IoT projects,” said Kathy Giori, Arduino VP Products. LoRa is a wireless RF technology developed by Semtech to create the lowpower, wide-area networks (LPWANs) required for IoT applications. Semtech LoRa chipsets are built into products offered by its vast network of IoT partners in the LoRa Alliance™ and deployed by mobile network operators. 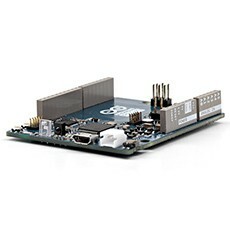 Arduino is offering two distinct LoRa-based shields, one endpoint-ready (for Arduino Primo and other 32-bit MCU platforms) and one gateway-ready (can be connected to Arduino Tian, which runs LininoOS). Using Arduino LoRa-ready shields, gateway devices are able to communicate on multiple channels at the same time, and bridge traffic to a backhaul network. The Arduino gateway shield is configured by default, to connect through The Things Network, a community of more than 4,000 members in over 60 countries building a global Internet of Things data network for LoRa-enabled endpoints. The addition of Arduino shields is expected to help The Things Network, which allows for things to talk to the Internet without cellular or Wi-Fi, to expand even faster. The shields will be compatible with the LoRaWAN specification standardized by the LoRa Alliance™, meeting its communications standards and compliance tests that products must pass to carry the LoRa logo.